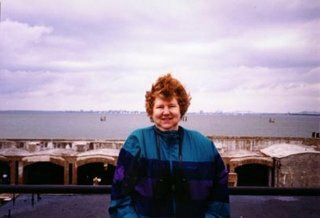 After a quick breakfast at McDonalds, we went back to the City Marina to set sail for Fort Sumter aboard the Spirit of Charleston. 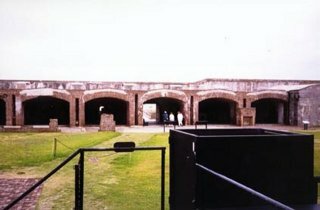 Fort Sumter was begun in 1829 and named for South Carolina Revolutionary War patriot Thomas Sumter. 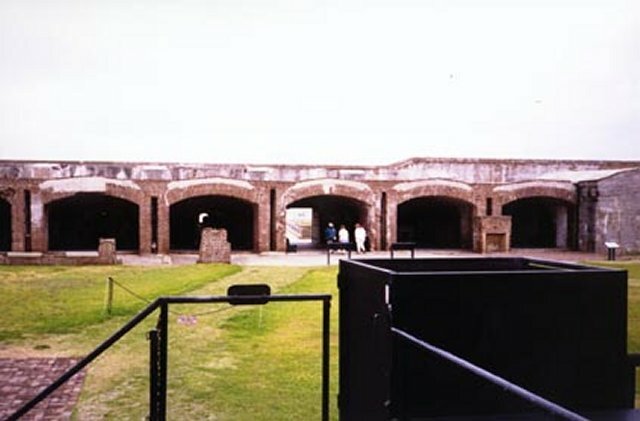 The fort became a national monument in 1948. Diana standing in front of the fort where the Civil War began in April 1861. View of the fort from ground level. We headed over to the historic district to Hyman's Seafood Company. Located in an old Charleston warehouse, the restaurant was established in 1890. It has been written up in over 30 regional and national publications with great reviews from all. The tables have little brass plaques giving the names of celebrities that have eaten there. Oprah Winfrey dined at our table. She must have gotten carried away, because the table was covered with gouges and scratches where she missed the plate. Despite the many accolades from restaurants reviewers, we rate the place merely OK. The building has a lot of character and you could look out the open windows onto the street but the food was only average. The Trawler has better she-crab soup and Hyman's fried green tomatoes aren't as good as Diana's fried green tomatoes. Click on for Diana's fried green tomatoes recipe. After lunch, we drove out to Sullivan's Island and the Isle of Palms. It's not a trip to the beach unless you go wading in the ocean. We called back home on the cell phone so our hard-at-work friends could hear the sounds of the surf. For dinner we went back to Shem Creek and ate at the Shem Creek Bar & Grill.